A long and wonderful journey deserves a special farewell. We find a spot away from the crowds, and our traveling companions, to have a reflective evening. This lets us process the special experiences we’ve shared, and also helps us transition to the trip home. 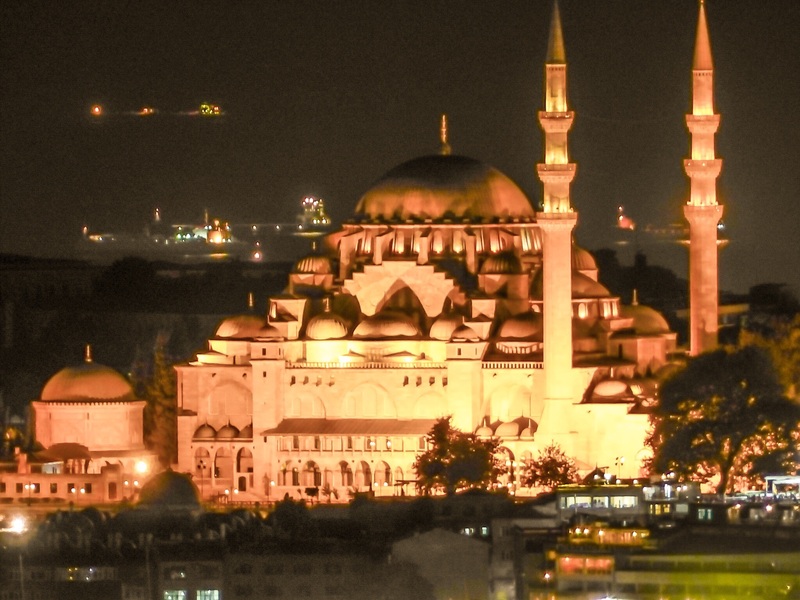 We began this tradition in Istanbul when we discovered the Mikla bar on the rooftop of the Marmara Pera hotel. The hotel is perfectly situated with views of the minarets and mosques of the old city as well as the modern skyline on the opposite side. Though essentially a bar, there’s a restaurant one flight below. Have your dinner there and head up to the roof for an after-dinner drink. Our guide with Istanbul on Food had recommended the bar, but we were especially thrilled upon returning home to find it featured on Anthony Bourdain’s Istanbul program. But what brought us, and ALL the other diners to our feet, was the sunset. 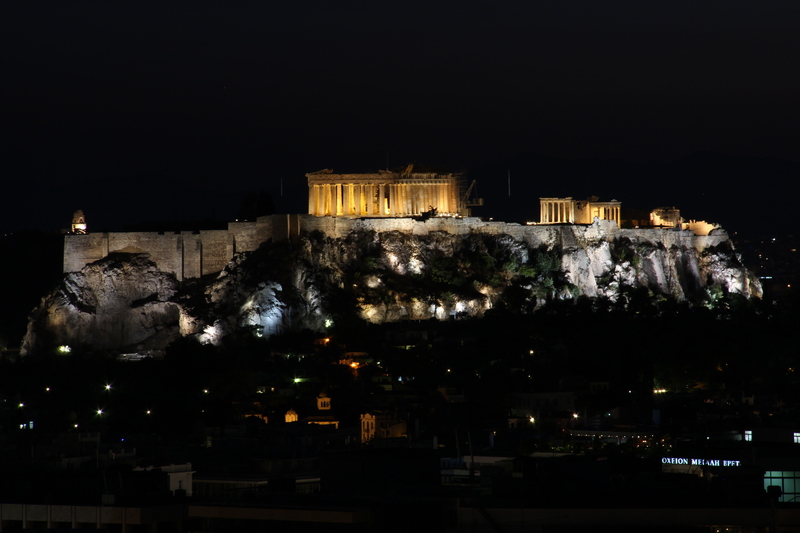 Conversation stopped as the sky turned golden over the Acropolis. Happenstance led us to Bellalisa Elevador, a great little spot next to the Santa Justa lift. We’d ducked in here for a quick refresher after visiting the Carmo Archaeological Museum. We were hot and the sangria was the best we’d ever tasted. We returned our last evening and lucked into a window table as someone had cancelled their reservation. The view that night was especially dramatic as a thunderstorm darkened the skies and lightning flashed over the Castelo de S. Jorge. Take a sunset cruise on the Tagus River. 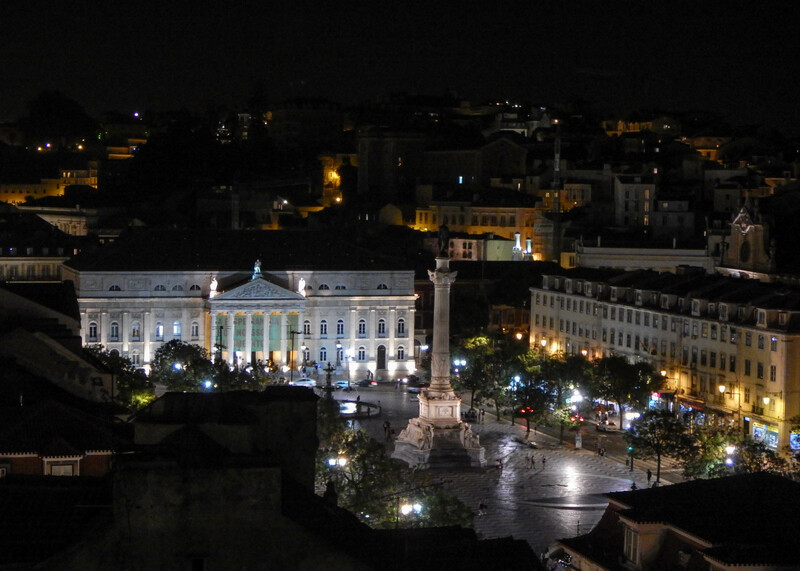 A perfect way to bid Lisbon farewell. In Rome we stayed at the Palazzo Naiadi, a gorgeous hotel that follows the curve of the Piazza della Repubblica. Our first night there the concierge guided us to the Ristorante Target opposite the hotel and told us to try the pizza. Best recommendation ever!! But the last night we enjoyed a rooftop table beside the infinity pool. The view was good, not great, but the service was wonderful. We ordered light meals, and were a little put off by the price. But it soon was apparent that we would got value for our money. 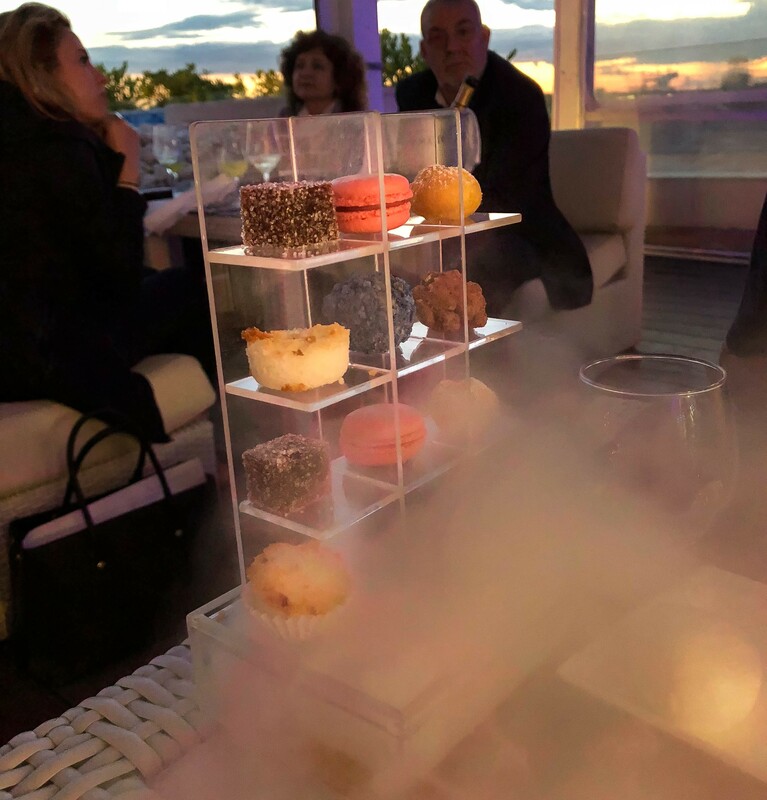 First complimentary prosecco, then complimentary appetizers, complimentary desserts (on a bed of dry ice), and finally complimentary limoncello. Every place in Venice is beautiful, but we chose our hotel, the Hilton Molino Stucky after seeing images of its rooftop pool. The hotel sits on the Giudecca canal overlooking the city. We loved this hotel, which offered regular shuttles to St. Mark’s square. The shuttle itself was a fun way to be on the water enjoying Venice. We knew we’d end our stay in Italy enjoying the rooftop pool and lounge. Perfect spot!! 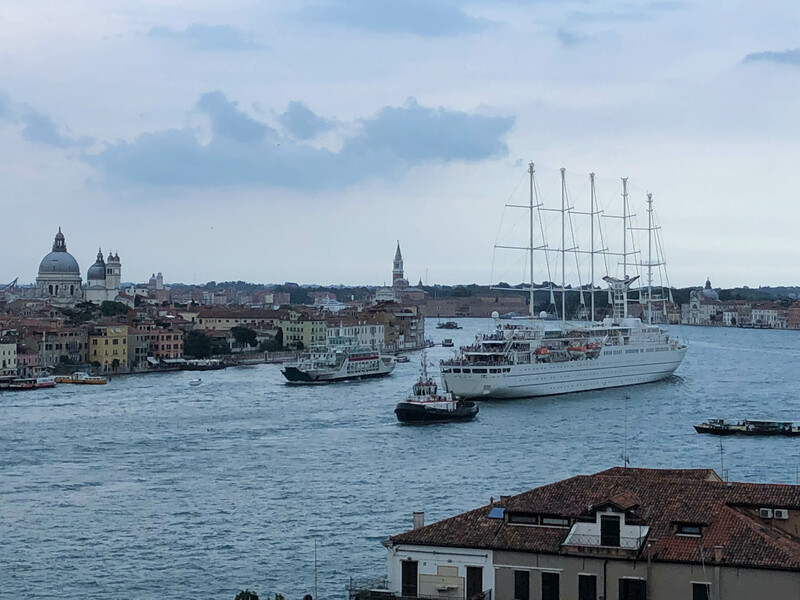 What made this evening extra special was the fact that we had traveled to Venice on Windstar’s Wind Surf and as we sat enjoying the sunset, the ship sailed past us, departing Venice for its next cruise. What a perfect send off! With a week long bike/barge tour behind us, we delighted in the Hilton Doubletree Amsterdam. (A modern bathroom! Wow!) The hotel is conveniently located on the Amstel river, right next to the train station. 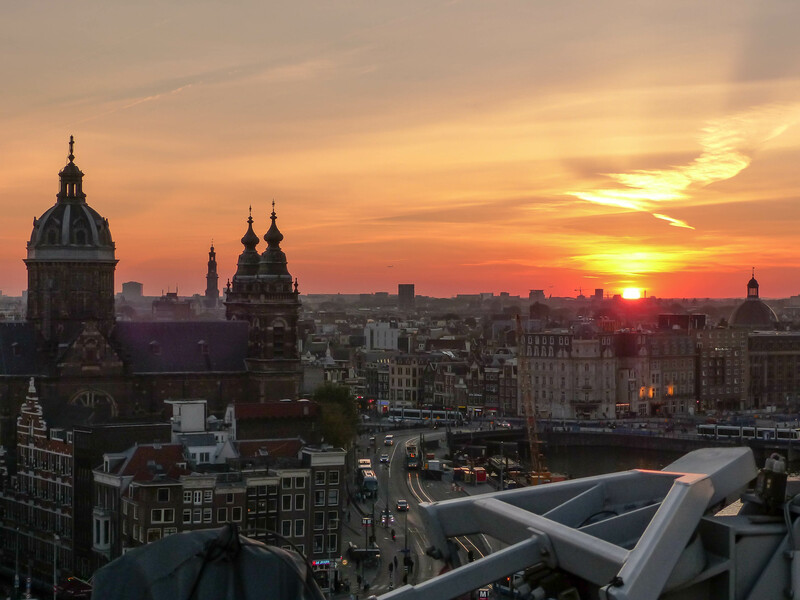 And its rooftop restaurant, SkyLounge, is rated the best in Amsterdam. The menu was limited, mainly small plates, but we enjoyed trying some Dutch specialties. As we hadn’t made a reservation we didn’t get the best table, but that didn’t stop us from walking to the railing to watch the sun set over the city. Mena House – OK, we didn’t make if for sunset, and it’s not on a rooftop, but what an incredible spot. To be seated by a lush garden looking out at the pyramids…sigh. Have any suggestions for us? We not above planning a trip just to find that special restaurant! Posted on March 21, 2019 March 23, 2019 by TravelingTullsPosted in Egypt, Europe, Greece, Istanbul, Italy, Netherlands, Portugal, Restaurants and BarsTagged Amsterdam, Giza, Hilton, Istanbul, Lisbon, Marriott, Rome, rooftop restaurants, venice, Windstar Cruises.